Born Into This, a film documenting the author’s life, was released in 2003. 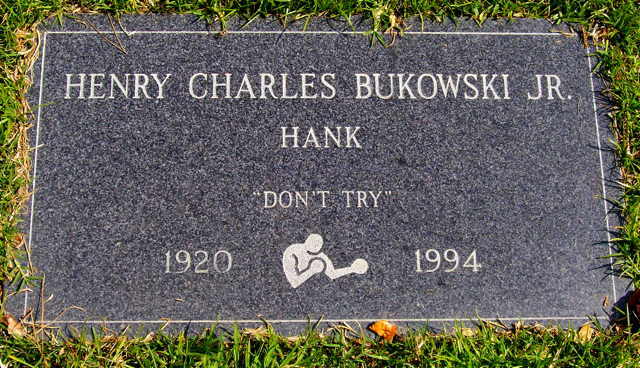 It features contributions from Sean Penn, Tom Waits, Harry Dean Stanton and Bono (U2’s song “Dirty Day” was dedicated to Bukowski when released in 1993). One critic has described Bukowski’s fiction as a “detailed depiction of a certain taboo male fantasy: the uninhibited bachelor, slobby, anti-social, and utterly free”, an image he tried to live up to with sometimes riotous public poetry readings and boorish party behaviour. Since his death in 1994 Bukowski has been the subject of a number of critical articles and books about both his life and writings. His work has received relatively little attention from academic critics. ECCO continues to release new collections of his poetry, culled from the thousands of works published in small literary magazines. According to ECCO, the 2007 release The People Look Like Flowers At Last will be his final posthumous release as now all his once-unpublished work has been published. If you don’t know where to start I would suggest ”Ham on Rye” which relates Bukowski’s childhood, adloeslcence and pre- adulthood, containing a lot of connotations that will help you understand better the why of Bukowski’s writings and personnality. Then I would go for Post-Office which relates Bukowski’s efforts to fit into the population and helped fashioned his legendary legs (!) and then maybe Women which helps understand his relations with women but that is just my advice… All his novels and peotry are amongst the best peices of american modern poetry so one way or another you will never be deceived. If you are an avid reader you owe it to yourself to at least try and read one of his novels or poetry and to do so with an open mind. He was and still is mine but he for sure was amongst the first to have a real impact on me. Thank God we all love him so its a good thing haha! You are terrific too and I have missed you! We should visit each other more often! Eat some Majung! PreviousDid Sid Really Kill Nancy?